In case you are just joining in: About two-and-a-half years ago our family moved from our long-time rural home to a different 19th-century farm house about twenty-five minutes from our previous one. I have been renovating the landscape around the house in a non-systematic frenzy and writing about it as time permits. 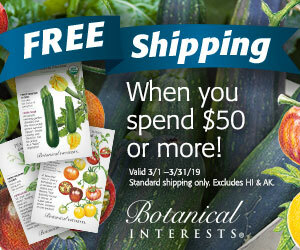 (Previous posts are archived in the New House, New Gardens category.) Today I am sharing my thought processes about a relatively uncomplicated area of the yard. Disclaimer: I am not trained as a garden designer of any type or stripe. 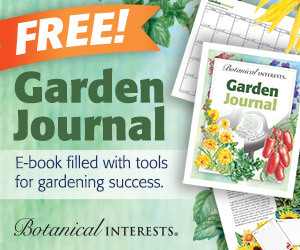 I am just an amateur passionate gardener who has read a lot of garden design books and mulled over what they have to say. What I am sharing here is my own personal approach which should not be construed as expert advice, rather more like a conversation with a fellow gardener. 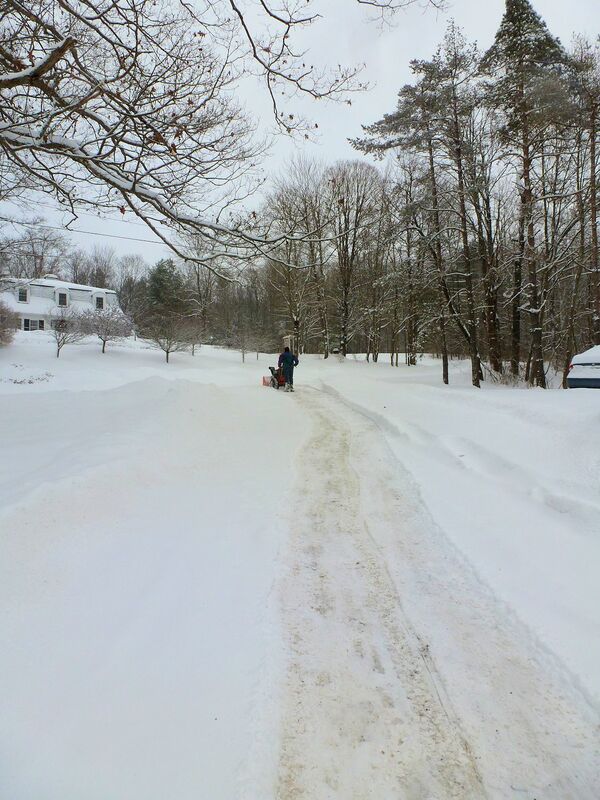 Our driveway slopes up from the garage to our country road. Under certain wintry conditions getting up that slope can be problematic. It doesn’t seem like such a steep slope in summer, but it can be hard to make it all the way to the top in winter, hence the parking pad to the right. This row of pine trees forms one side of the parking pad bed. The driveway out of view on the right, forms the other side. and the driveway proper on the right. A stone retaining wall with a planting area separates it from the carriage barn below. It is this planting area that I have dubbed the Parking Pad Bed. What is the function of this area? Or, how do I want it to function? From where do they see it? What does this area need to improve its function and looks? What is the function of this area? When you’re designing the yard around a house that has several family members living together, I think it’s very important to start with the function of the area you’re trying to improve. How is it currently used by the various members of the family? There is no sense planting Mom’s Favorite Roses around the sandbox where the children play–unless Mom sits on a bench close by while they are there. I always want to design an area to work with the way it’s already being used. And if I’m envisioning a new function for an area, I try to set up a dry run (stamping a path in the snow to stand in for an envisioned front walk, for example) to make sure I’ve got it right. I’ve already mentioned the function of this area: a place to park cars. Three cars can fit in this area. Two cars are parked here on a regular basis. However, when we get logs delivered for firewood, they are off-loaded in the area by the pine trees. This is the only area where it practical to take delivery. For about a month in the spring this becomes the woodcutting area while the logs are chainsawed into sections. 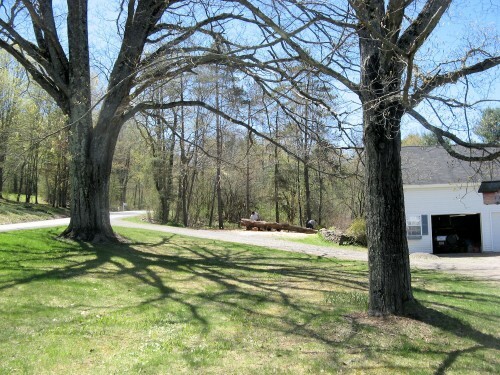 Here you can see the slope of the driveway, and how the parking pad relates to the carriage barn. Two family members are cutting next winter’s firewood on the parking pad. That is the only other function of this area, and it’s a temporary one–but it still should be kept in mind. That is another question that’s easy to answer. The people who use this area are the car drivers and passengers, entering and exiting their vehicles. On a seasonal and temporary basis, the chain saw operator and his helper are in this area. Who views this area? And from where? Obviously the people who use the area also view it. But the car passengers are not in the area very long and typically aren’t interested in lingering and the wood cutters have other things on their minds. However, there is a third group of viewers. When no cars are parked here, this bed is visible from the road. The car passengers can see this bed up close if they so desire; those driving along the road will only see it from a distance and very briefly–unless they stop dead in their tracks to take a better look (which I would consider a high compliment). What does this space need to improve its function and looks? To improve the view for the passengers, I have planted small things that merit close inspection right at the edge of the stone wall. ‘Lilac Wonder’ colchicum has a reputation for floppiness and it now drapes itself over the stone wall. 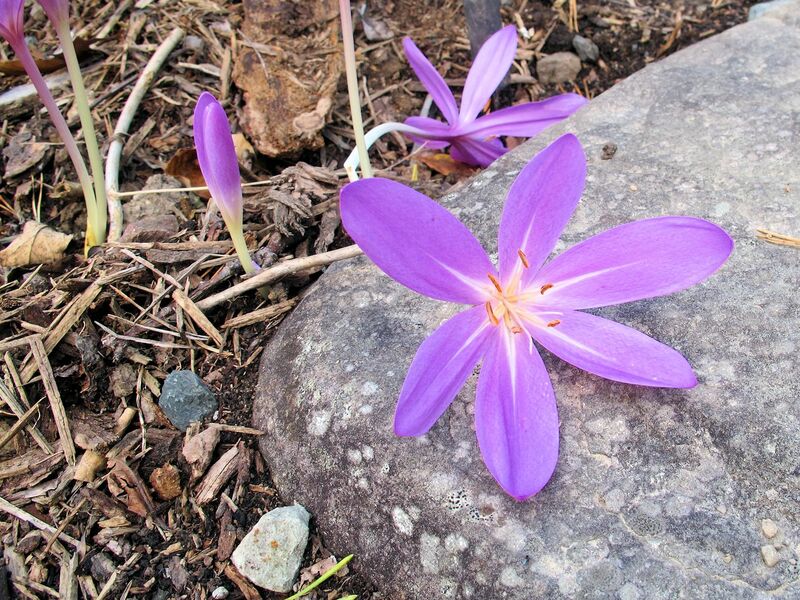 This floppy ‘Lilac Wonder’ colchicum drapes itself over the edge of a stone wall. Double snowdrops are easier to view when planted a couple of feet off the ground. 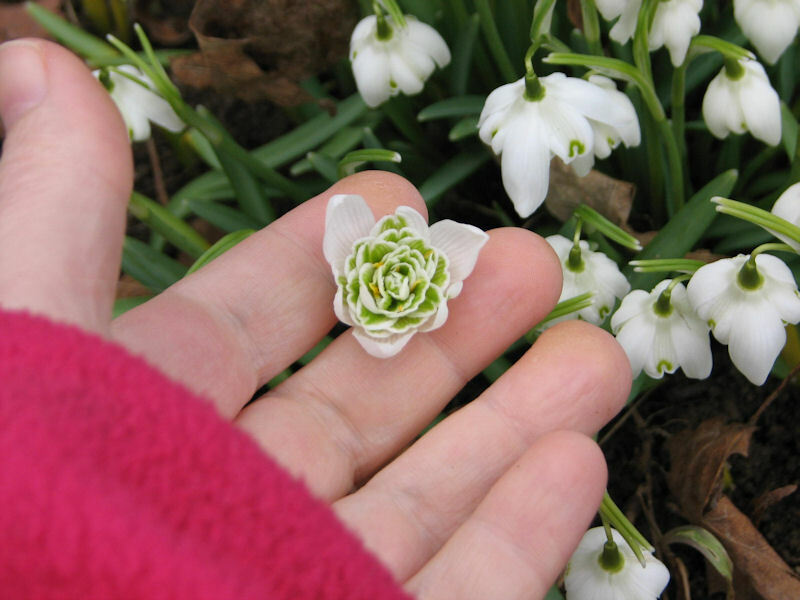 You have to turn a double snowdrop upside down to see the exquisitely layered petals, which is more easily done when they are planted in the raised parking pad bed. 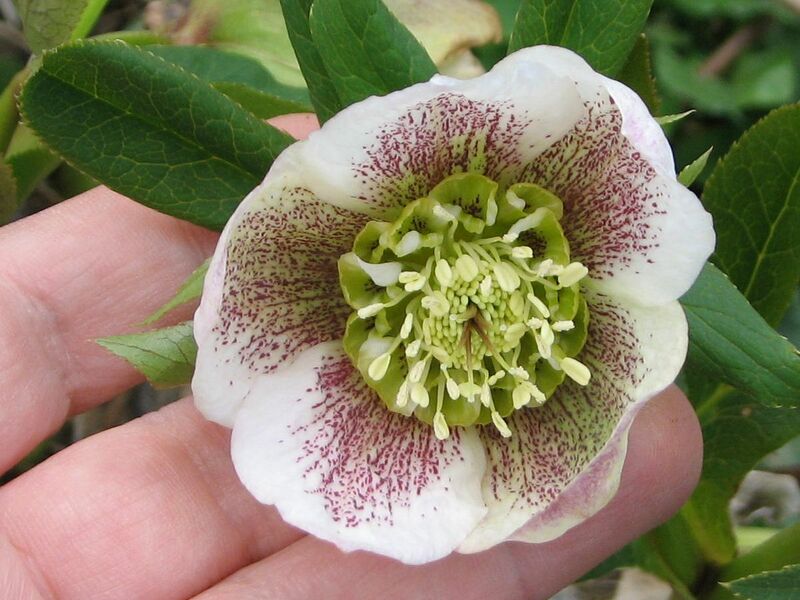 Likewise many downward facing hellebores are easier to enjoy from a more elevated vantage point. It is easier to view the intricate stippling inside this blossom when it is growing in a raised bed. Let’s face it, people intending to get in a car are focused on where they’re going to go. People getting out of a car are usually focused on going into the house and attending to the next thing on their schedule. Maybe if it is an especially nice day they will linger and take a look at the small treasures I have planted. But honestly, these little plants are mostly planted for me. 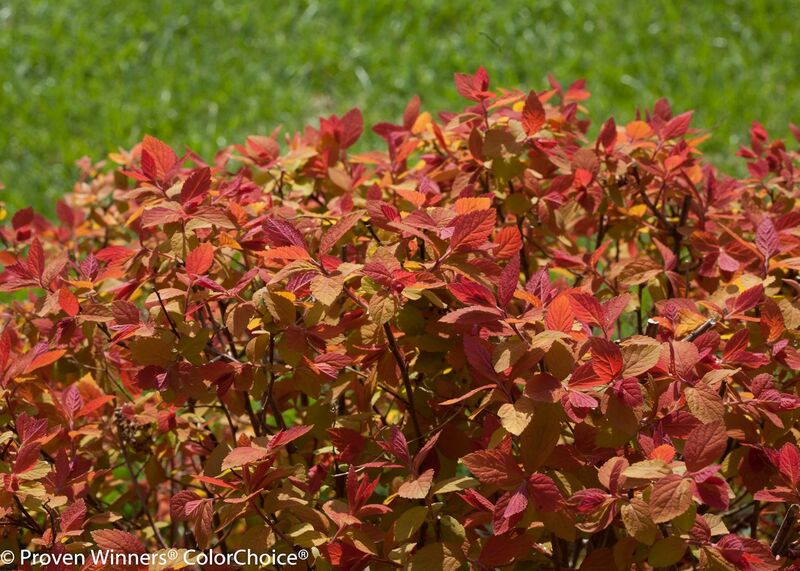 For those driving or walking by, plants with a good deal of mass–such as shrubs–are called for, as well as bright, vivid color. This is what is most easily taken in from a distance, especially while moving. This bed was already planted with shrubs and perennials when we moved here. This view of the parking pad bed, taken from the lower vantage point of the carriage barn, shows the shrubs that were here when we moved in. 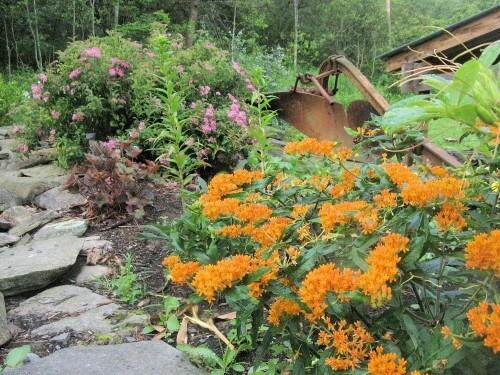 Butterfly weed in the foreground and a spirea (Spirea x bumalda ‘Crispa’ I think) in the background. I kept this unknown variety of summersweet because it has good fall color. 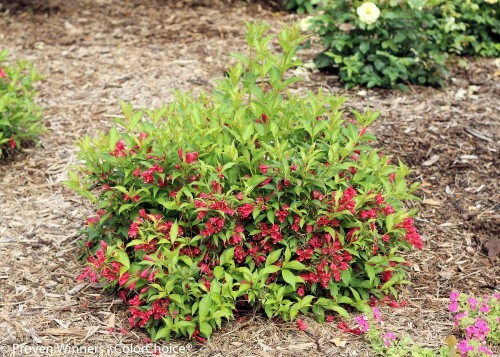 This summersweet shrub (Clethra sp.) was here when we moved in and has good fall color. There were already some brightly colored perennials planted in this stone-walled raised bed, most notably the butterfly weed pictured above with the spirea. 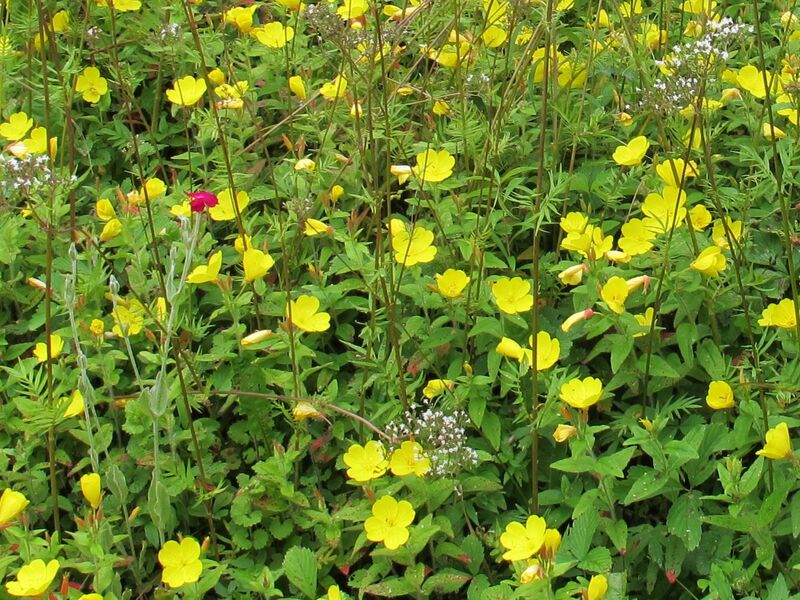 I moved some sundrops (Oenothera fruticosa)from the slope garden to give some early summer color. 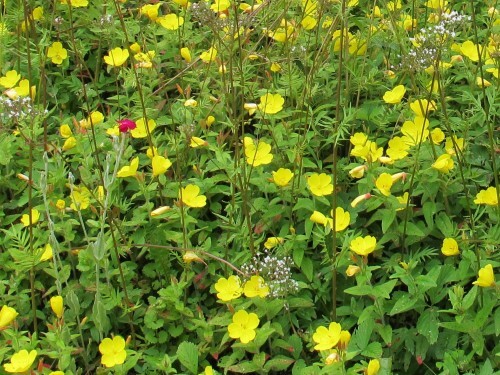 I had plenty of sundrops (Oenothera fruticosa) from the slope garden that I could dig and replant in the parking pad bed. I also planted some tiger lilies as well as Lilium henryii. I also planted several orange-flowered daylilies and a ‘Short ‘n’ Sassy’ helenium that was a trial plant from Skagit Gardens. The one thing I planted that I now regret is the ‘Distant Planet’ crocosmia I had transplanted from my old house. This crocosmia is reputed to be the hardiest variety of its type. It did not come back in spring 2013, after being planted the fall before. I belatedly realized that much of the snow removed from the parking pad gets piled on top of the parking pad bed. The parking pad bed in early March. 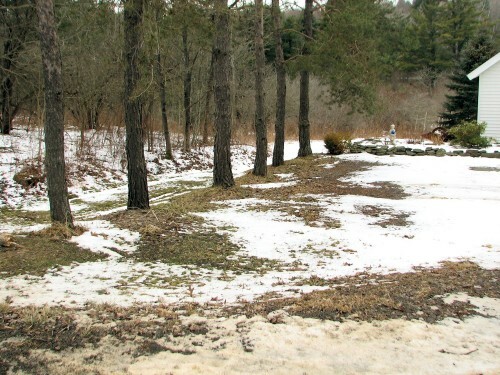 Consequently it is one of the last places to be finally rid of snow and is subject to more snow melt for a longer period than any other garden area. The crocosmia bulbs just rotted from excess moisture. In a climate where snow is expected for most of the winter, where that snow is piled up should be a factor you consider as you design or redesign an area. Many of us are not going to be able to afford professional advice as we turn our yard into a garden, but we can all apply a little common sense as well as our own aesthetic sense to the area surrounding the house. The parking pad bed was already well on its way to achieving my goal of sending an unambiguous color signal to all who view it, and if I hadn’t had the brightly colored plants on hand to make changes, I would have waited until I did. Creating a garden is never an instant production, but a slow melding of the plants’ suitability to the site and the gardener’s evolving taste, skill, and ambition. 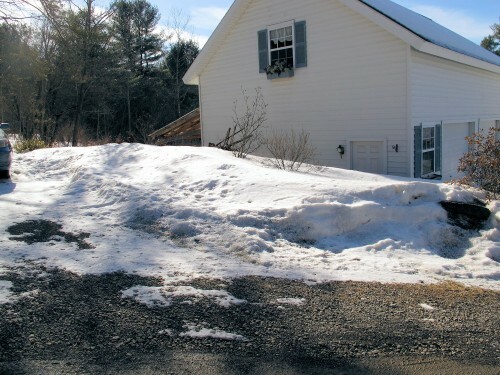 You may also need to consider whether the area by your parking pad will contain too much plowed or dumped snow for the shrubs you are putting there. I have learned from experience not to plant shrubs along the narrow south side of our driveway because that’s where my snow plowing husband shoves the snow. The snow can get deep enough that it would cause breakage, plus there’s the likelihood of the plow running into the shrubs. I did plant one Gold Cone juniper there but it’s near a corner post for the gate and protected somewhat by that. Still it’s a bit bare on one side from having been buried under snow for too long a couple years ago. The other plants all along that side of the driveway are perennials that die completely back to the ground in winter. Also, I’ve avoided cute little edgings along there like sedums, because they sometimes get scraped right up by the early plowing. Your point is well taken about too much snow on the shrubs. Even if it doesn’t cause breakage there might be too much moisture. They are planted there now, so only time will tell. However they aren’t in danger from the snow blower (no plow here) because they are in a raised bed. Kahty like you I am an amateur and love this post. You ask the perfect questions we must consider. I am observing, pondering and then reworking areas of the garden. I decided I need to do maintenance and have a better plan than my hit and move method. I will use some of your great advice. Hi Kathy, It looks a bit woodsy, so I thought seeing some carefree shade tolerant perennials like Monarda, Aquiligea and Campanulas (lots to choose from) might mix in well. Plus the deer don’t particularly like them and we up-staters know all about them! 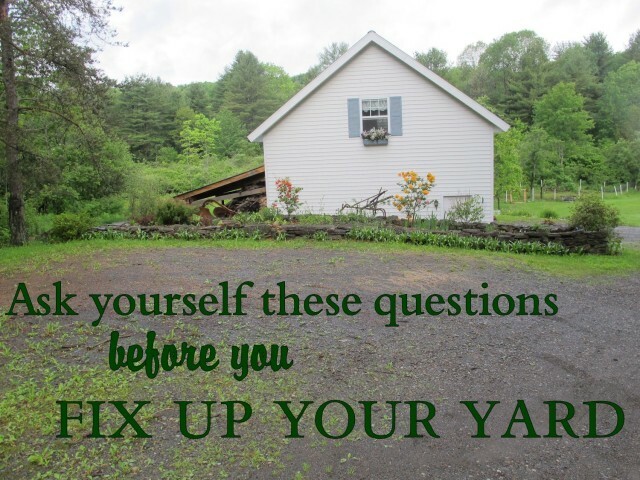 BTW, Great questions to ask before you start planting. Hi, Amanda, thanks for stopping by to comment. You are correct in that beyond the row of pines the woods begins. The light there is actually very complicated with various shade trees blocking the light on parts of the bed, but the whole bed is never in complete sun or complete shade. I did actually plant some red monarda that I moved from the slope garden; I just forgot to mention it. 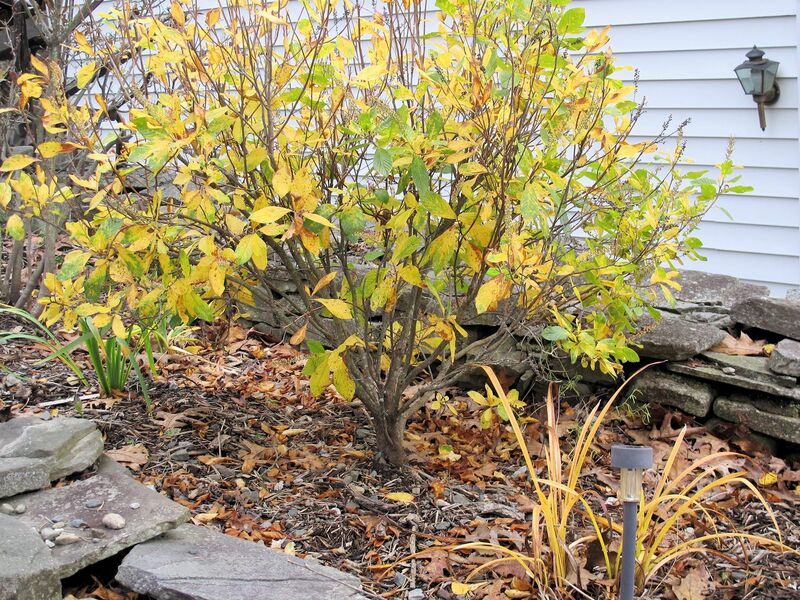 I actually am trying for more shrubs in that bed, so would be looking for shrub-like perennials or more ground cover types. But I have all three of the plants you mention in many other areas of the garden. Thanks for such a well thought out plan for design and redesign! I sometimes get too bogged down on where to put a specific plant and forget about what I’m (tying) to do out there. I’m glad you agree. My family thought I was nuts, even the certain family member who helped me move them. After all, they only bloom for a couple of weeks. But I think they look a lot better in front of the porch. At the moment they look near death but I’ll let you know in May. Awesome flowers. I love Liac flower. Great article with nice images. That tiny white flowers are they wild flowers? They look so cute and tiny. Great work keep posting. Hi, cocojen-The tiny white flowers are snowdrops. They are not wild here, although you can plant them in such a way that it gives that impression. They do go wild in Great Britain although I am not sure they are native there. I always question a plant’s usefulness to wildlife as well, and if it is native since I like to attract birds and such to my small village garden. I love that you have asked yourself so many questions – it really does help push the design process along. I think I would seek your advice over a professional designer since you are a passionate gardener! Sometimes field experience and passion trump education and credentials in my mind. I hardly consider you an amateur. What a beautiful property! Another point to consider in the functional assessment, is environmental control. 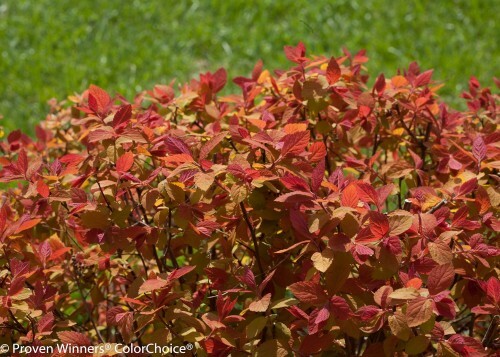 Are plantings needed for shade? wind control? Snow drift control? Likewise, is there an environmental effect that needs to be considered for the hardy aspect of a planting? Your color choices and plant placement is wonderful. Love considering how to best view the plant’s offerings. Beth, that is an excellent point. For the parking pad bed, it wasn’t much of an issue, but I suspect I often do consider such things without realizing it. Erosion control would be another factor to consider, especially for slopes. And for those with mobility issues or anticipating them as we age (ahem!) ease of access and ease of maintenance should also be considered. I consider ease of maintenance different than low maintenance. Anyone who loves gardening wants to putter and tend their plantings, but it has to be matched to their current abilities. Things like arthritis may require the plantings to be changed. 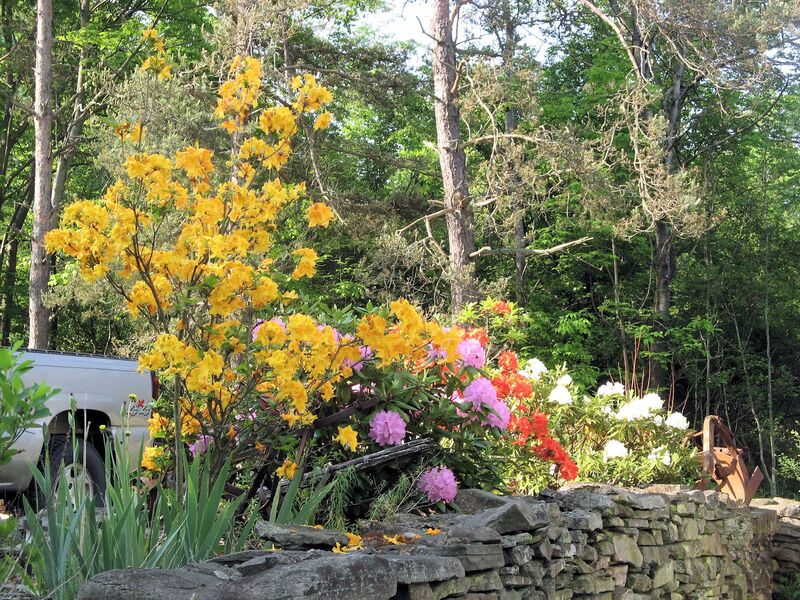 Judy, I checked with a friend who lives out west (I’m in upstate NY) and she agreed with me: where you are those bulbs should be hardy without any mulch whatsoever. They can take -17 degrees without snow cover. In fact, covering them with such a deep covering of straw has probably encouraged them to come up early. I would remove a couple inches of straw each week so they can get acclimated to the current temperatures. And next year I wouldn’t bother to mulch them at all for winter protection. You are correct that snow is an excellent insulator, but those fall-planted bulbs can take even a snowless winter. And if they started to come up and another cold spell comes along, they are not harmed at all. Great post, Kathy. 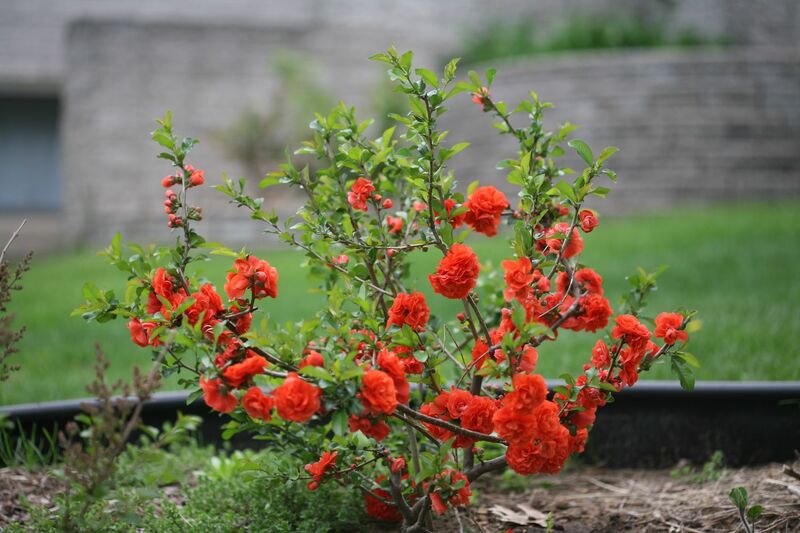 I enjoyed following your train of thought and look forward to seeing photos of the shrubs when they have grown. That’s a very good point, about the areas in which snow get piled being waterlogged. It should be obvious, of course, but I hadn’t thought of it. Thanks so much for directing our attention to it, especially good to think of as our snow Finally melts. (I love when I learn something important from reading blogs!). Kathy, I like your 5 step analysis: simple but effective. I need to keep those things in mind when I’m overcome with the urge to redesign! If an area of your garden is mostly “for looking at” or “for decoration” I’m not sure my questions help as much in the decision-making process. In that case, if you don’t like the way it looks and you want to change it, what’s to stop you? I guess that’s why people tend to follow a “style” of gardening, either consciously or unconsciously. It helps them make decisions about what to include and what to leave out.